The COP 23, organized under the presidency of the Fiji Islands, is hosted by the government of Germany and the City of Bonn from 6 to 17 November 2017. Our activity in Bonn showcases the enormous potential of our constituency for implementing practical solutions that can effectively mitigate and adapt to climate change. Local and regional government delegations followed daily discussions. The Local Governments and Municipal Authorities Major Group (LGMA) is actively engaged in this COP, taking part in the following events. Last year, the Marrakech Partnership was adopted at the COP 22 in Morocco. It gave Non-State Parties a prominent role, highlighting the impact of their actions and the need to support them in continued actions. 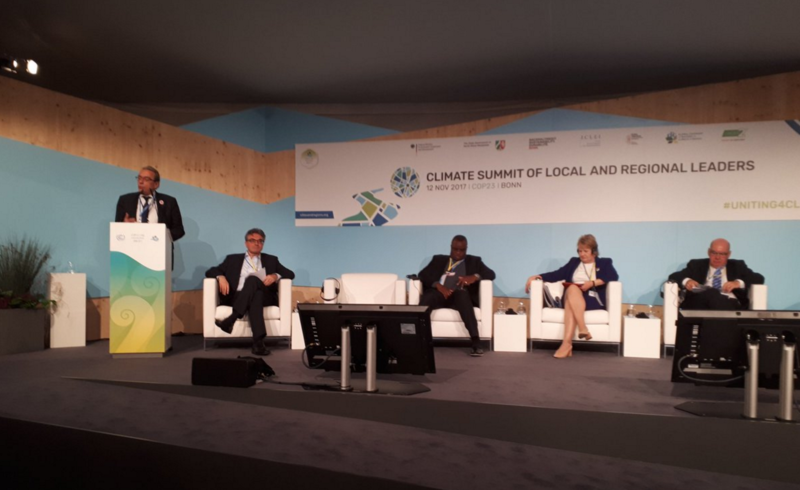 In the follow-up, for the COP23, Local and Regional Governments mobilized for the Climate Summit of Local and Regional Leaders on the 12th of November. A number of thematic days were held during the first week, as well as high-level roundtables on Monday 13 and Tuesday 14 for Non-State Parties (UN, ONG, LRGs, and Business). Sessions focused on Forest, Energy, Water, Ocean, Agriculture and human settlements were held on 10 and 11 November in the Bonn Zone. The local and regional government constituency and its partners lead the organization of Human Settlement Day on the 11 of November, from 10.00 am to 8.00 pm. The Climate Summit of Local and Regional Leaders took place in the Bonn Zone. For the first time, the Climate Summit of Local and Regional Leaders was organized in the official framework of the COP under the invitation of the United Nations Climate Change Secretariat, which shows the importance of multilevel governance to tackle climate change. 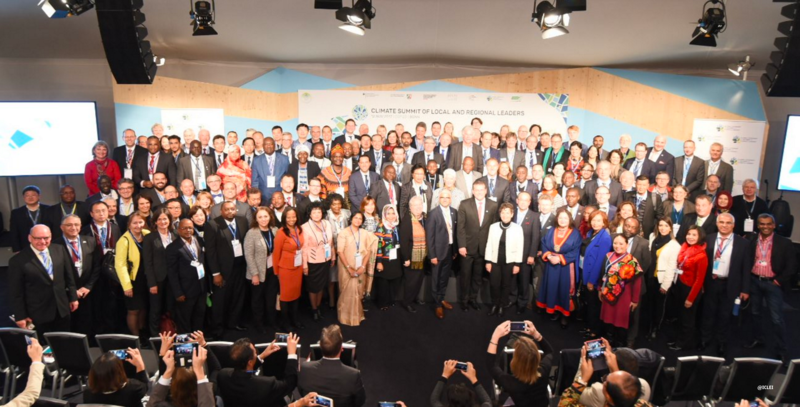 Local and regional leaders from around the world gathered together at the Climate Summit of Local and Regional Leaders to show that local and regional leaders are already driving climate action forward and are implementing concrete policies to achieve the Paris Agreement and the other major global agendas. Roland Ries, Mayor of Strasbourg, President of Cités Unies France and Co-President of UCLG emphasized that "we are responsible for the future, we must mobilize to act now, networks are essential to achieve this goal". 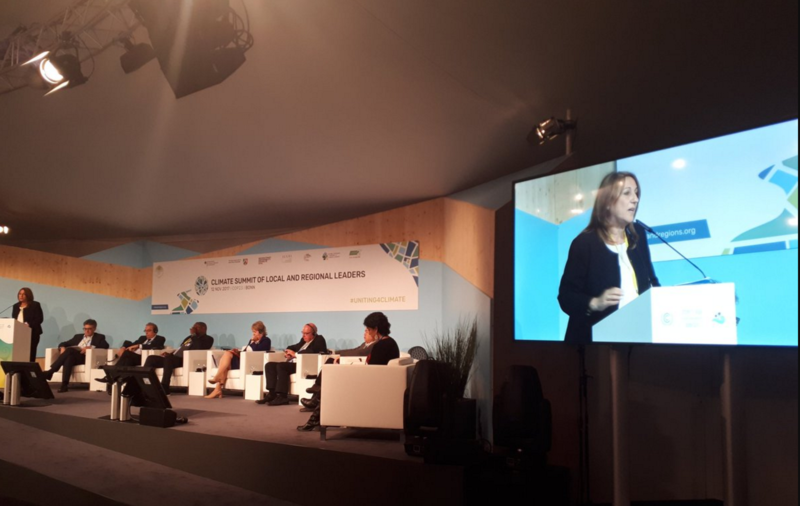 Patricia Espinosa, Executive Secretary of the UNFCCC closed the Climate Summit highligting the vital role of local and regional leaders and their networks in climate action and in raising global climate ambition. Finally, local and regional leaders committed to the The Bonn-Fiji Commitment of Local and Regional Leaders to Deliver the Paris Agreement At All Levels. The Bonn-Fiji Commitment recognizes local and regional governments as key contributors to the current international discussions and the global climate community. Is a set of commitments, ambitions and actions for local and regional governments to implement the Paris Agreement in our jursdictions in coherence with the 2030 Agenda and other major global agendas, enhace the resilience of our communities and coperate with local and regional governments globally. The local and regional government constituency co-organized the opening plenary session of the High Level Round table on SDG11 that took place on Monday 13. The panel gathered women mayors, city leaders and civil society leaders who are driving forces to accelerate the transition to sustainable and resilient cities for all. 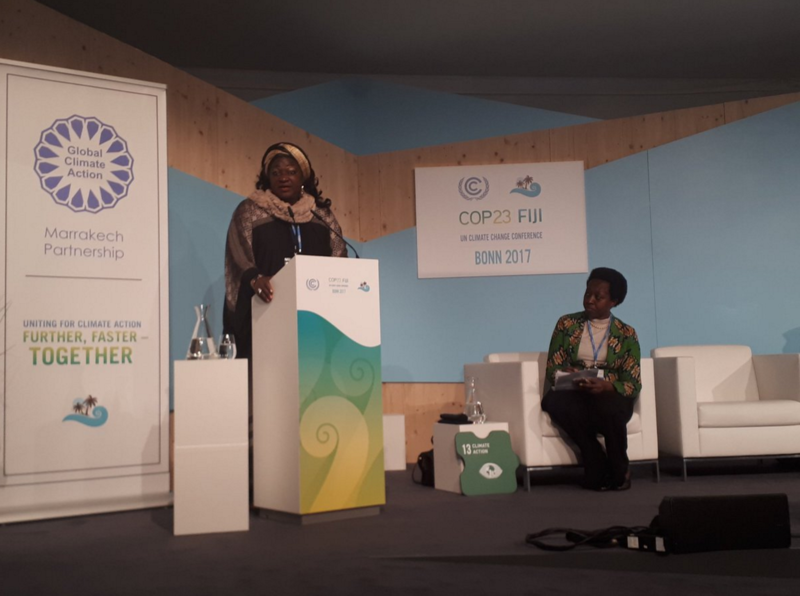 Célestine Ketcha Courtès, Mayor of Bangangté and President of REFELA called for the implementation and support of concrete climate and sustainable development actions that can be replicated. The local and regional government constituency is co-organized this proposal aiming to ensure that the localization of financing gets appropriate visibility. 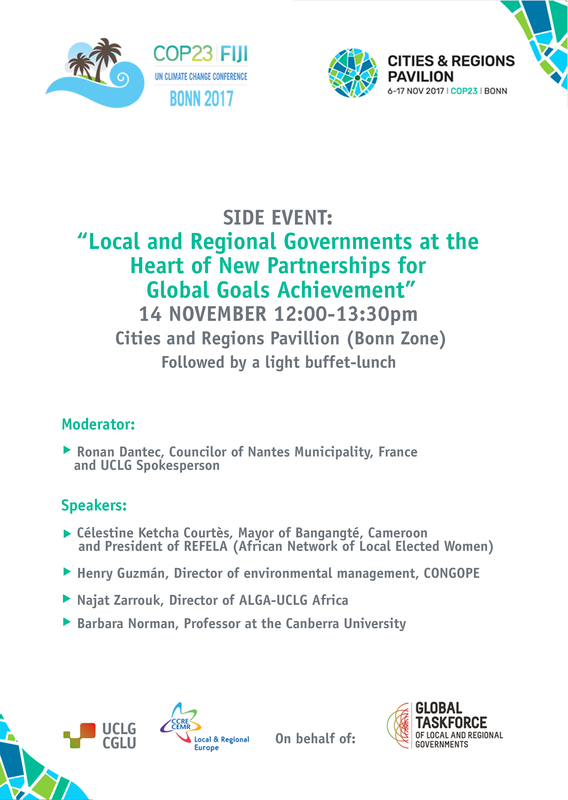 On 14 November, UCLG and CEMR are holding on behalf of the Global taskforce a side-event on” Local and Regional Governments at the heart of new Partnerships for Global Goals achievement” at the Cities and Regions Pavilion from 12.00 to 13.30 pm. The session will be flowed by a light buffet-lunch. The Cities & Regions Pavilion is located in the COP23 Bonn Zone, at the entrance of the Exhibition Center and directly across from the press and media center. The Cities & Regions Pavilion is the home base for local and regional governments, offering a space for meetings, briefings, networking and partnership building throughout the full two weeks of the UNFCCC COP23. The Cities & Regions Pavilion is organized in a special partnership with the German Ministry for the Environment, Nature Conservation, Building and Nuclear Safety (BMUB).